It is safe to say that many women in the West dream of a white wedding dress. When they envision the perfect wedding dress, it usually is all in white. But women in other cultures get married in a hue of different colors - Chinese and Indian cultures tend to favor red tones for wedding dresses. Check out Lisa Ling's striking red wedding dress (see picture on the left). So why not you too? 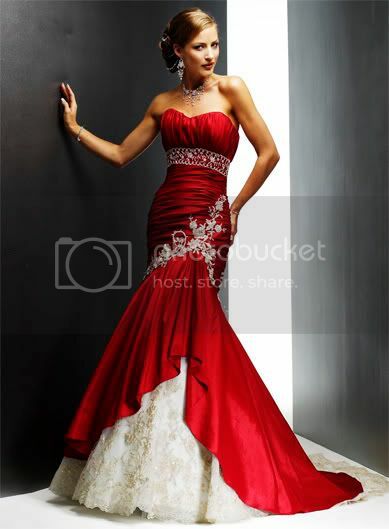 Red tones for wedding dress would be a lovely choice indeed for a bride wanting to make a bold statement - so in this article, we devote space to a selection of red-white wedding dress, and red wedding dresses. Simple, clean cut and elegant bustier bodice red wedding dress. Red wedding dress with lace-up corset bustier. The classic red sash on white wedding dress. Chic red wedding dress with white lace. Elegant white wedding dress with striking red at the back.